Description: Metallica was hand kettle dyed before carding. 80% adult mohair, 20% Shetland wool. Has a metallic sheen from the large amount of mohair. Description: Jupiter was hand kettle dyed before carding. 59% mohair – 45% Blue Faced Leicester & Shetland wool. 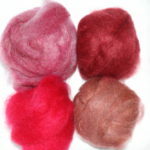 Description: Fuschia is hand kettle dyed before carding.